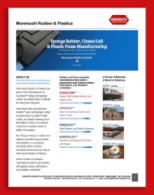 54 Reasons Why Monmouth Rubber Will Help Improve Your Products And Your Bottom Line. During each of our 54 years we learned something new or how to do something better from working with our customers one on one. 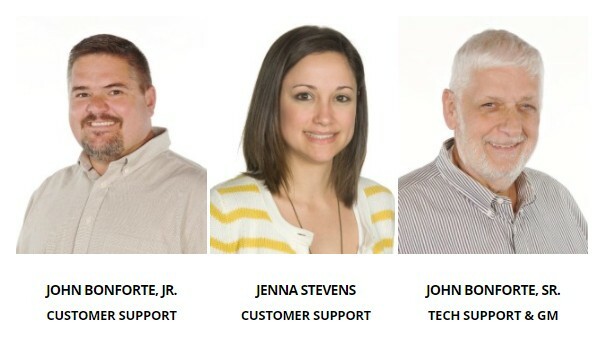 We cataloged all of this information in our technical support library. It is filled with 54 years of solutions to customer problems. Customer driven with solutions that what we have done, still do and will do for you. Our problem solving ideas scan the world. Our solutions are put into practice here in the USA. So here is the 54 dollar question: try us out with an idea, problem or any wild thought and see how we do for you. 54 reasons that make it work for you. Visit us at Foam Expo – Booth 928 – Want to set up a meeting with us at Foam Expo? Call Call 1-888-362-6888 Ext 13 – Jenna Stevens. Learn about application development, material requirements and testing best practices from the industry experts at Monmouth Rubber & Plastics, and find out how these solutions could be transferred to your technical applications. Reprinted excerpt from Foam Expo Show Preview Brochure. 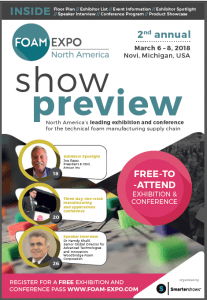 Being held March 6-8 in Novi, MI, Foam Expo is a free-to-visit event. I invite you to meet colleagues from North America, Europe and Asia who share an interest in – and are leading the development and marketing of – the latest innovations in advanced and technical foam materials and products. Foam Expo offers you direct contact with the engineers and executives who produce materials and products used in automotive, aerospace, construction, medical, packaging, and sports and leisure. You’ll see exhibitions of materials and products that set new standards across a wide range of applications. Our aim is to give the technical foams industry the stage it truly deserves. If you are involved in the purchasing, integration, manufacture or supply of materials, products or equipment, you can be certain that your suppliers, customers, competitors and peers will all be at the show! The ‘Joy of Rubber & Plastics‘ is our 34-page educational booklet, containing definitions, practical advice and explanations concerning closed cell materials. This book was written for all of us who grew up in a time when closed cell sponge rubber was a taboo subject. One which we dare not ask either our parents or grandparents to explain, let alone a sales manager. If you are like most people from our generation, you had to learn about closed cell sponge on the streets or in dark alleys. Even after we progressed into our respective business careers little, if any, information was available as to the basic facts of how closed cell sponge is made and used. This book is an attempt to bring this verboten subject out of the closet and perhaps maybe some day even into the classroom. Chapter One will be a definition of terms. Before going into a brief description of what closed cell sponge is and how it is made, it is important that certain basic terms used in the industry are defined. Keep in mind when reading these definitions that they have often been misused and that you are probably accustomed to hearing them used in the wrong way. While your proper understanding of these terms is necessary, the most important point is that your technical communication with the factory be correct. The ‘JOY OF RUBBER & PLASTICS’ is Free to read and download. The “Shelf Life of Rubber” is an informative video on the general shelf life properties of rubber. It is narrated by Rubber expert, John Bonforte Sr., GM & Tech Support Director at Monmouth Rubber and Plastics. “Don’t confuse shelf life with service life of rubber” – learn more, watch the video. LONG BRANCH, NJ – Recycled rubber provider Monmouth Rubber & Plastics Corp. has been re-certified to ISO 9001:2015 standards. Transcript for ISO 9001:2015 for Monmouth Rubber & Plastics Corp. Manufacture of cellular & solid rubber and plastics. and remains valid subject to satisfactory surveillance audits. Recertification audit due a minimum of 60 days before the expiration date. Issue 5: 18 May 2017. Certified since July 2008. Monmouth Rubber & Plastics has been a U.S. Manufacturer of Durafoam™ closed cell sponge rubber and plastic foam materials for more than 50 years. Monmouth also manufactures Airaflex™ open cell sponge rubber & plastic foam; Duraflex™ solid rubber and plastic sheeting; and Bondaflex™, which is a material made from recycled rubber & plastic composites. Our 50 year history in rubber and plastics manufacturing provides vital stability in a constantly changing rubber industry. Companies know they can rely on Monmouth Rubber & Plastics. All our rubber and plastics materials are sold in partnership with gasket cutters, fabricators, and resellers worldwide.